NeoCell Beauty Bursts represent the next generation in "Beauty from Within" products: effective ingredients in a new, exciting delivery system. Beauty Bursts deliver beauty-building Super Collagen, Hyaluronic Acid and Vitamin C - all in a delicious, all natural soft chew. Beauty Bursts, like all NeoCell nutricosmetics, are designed to nourish the body with healthy nutrients to enhance beauty from the inside out and fight the effects of aging. 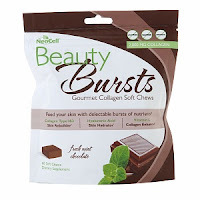 NeoCell Beauty Bursts currently come in two gourmet flavors, Fresh Mint Chocolate and Super Fruit Punch. A serving of each has only 40 calories and contains no lactose, gluten or artificial ingredients. The suggested serving is 2-4 chews per day. These NeoCell Beauty Bursts taste really good and they are a great treat that you can feel good about. I loved saving these for my snack after the kids go to bed. It's not offen that you can eat a treat that accually is helping your skin! Beauty Bursts are available in 60-count bags with a suggested retail price of $19.95 and will soon be available through Whole Foods, Vitamin Shoppe, Drugstore.com and other retailers nationwide.